For a new salad that I have been thinking about I wanted a nice and cool and creamy dressing and I was thinking about trying something a little bit different, an avocado dressing. 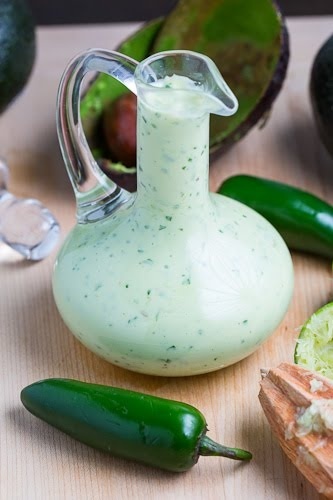 I was originally planning on including diced avocado in the salad but I liked the idea of a creamy avocado dressing even more. I did make one quick change to the recipe by including some mayonnaise which goes fabulously well with avocados. I have to say that this avocado dressing is amazingly good; nice and creamy so so fresh and vibrant! Now I just need to resist eating it all by the spoonful so that it can make it into the salad!